It was such a privilege and honour to go to UNESCO headquarters in Paris to accept the UNESCO Confucius Prize for Literacy on behalf of the FunDza Literacy Trust. 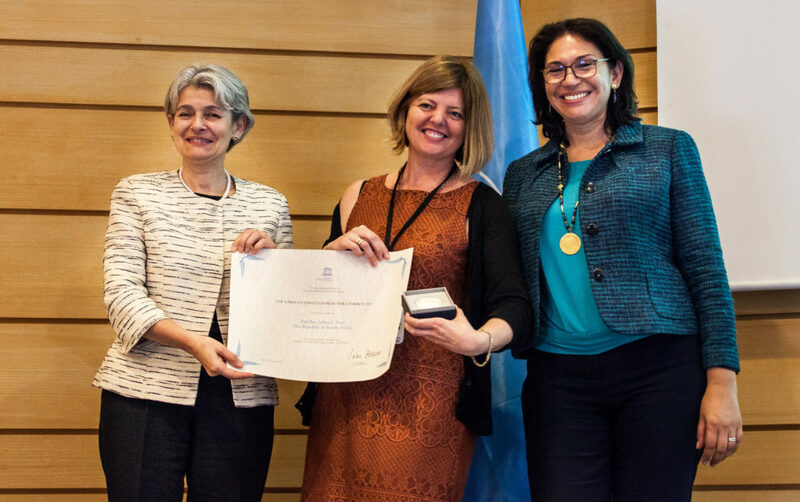 The prizes were awarded on International Literacy Day (ILD), where literacy-minded individuals and organisations from around the globe congregated at the UNESCO headquarters to speak about the growing need for literacy development. The theme of this year’s ILD was Literacy in a digital world. The day’s conference explored the type of literacy skills people need in order to navigate an increasingly digitally-focused world. The day highlighted the challenges and opportunities in promoting literacy in the digital world, a world where, despite progress, at least 750 million adults and 264 million out-of-school children still lack basic literacy skills. 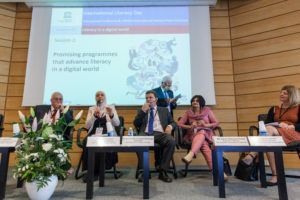 During the day’s proceedings I participated in a panel with the other four laureates of the UNESCO Literacy Prize that investigated how digital technology was improving literacy teaching and learning and the creation of literate environments. It was fascinating to hear how technology is being used in a variety of projects around the world and to hear all the laureates introduce their work. Rana Dajani of the We Love Reading project based in Jordan spoke with great passion about the reading groups that are now getting young children to love books in 30 countries worldwide. Amna Khalid of The Citizens Foundation in Pakistan introduced their Aagahi Literacy Programme for Women and out-of-school girls, that uses technology to conduct assessments and provide support for their staff. 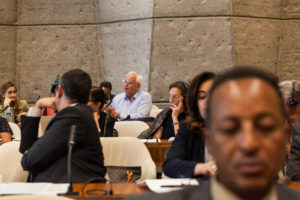 While Bernardo Arango Restrepo, Secretary of the Secretariat of Information and Communications Technologies in the city of Armenia in Colombia, which launched the AdulTiCoProgram recounted stories about the impact that learning digital skills was having on the senior citizens that participate in the programme. Philip Abrami of the Centre for the Study of Learning & Performance at Concordia University (Canada) spoke about the project that they are running with learners in Kenya to use technology to build language skills. 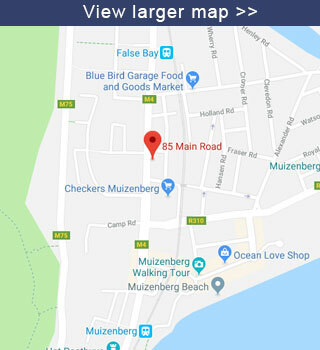 While I spoke about our work at FunDza that uses mobile technology to encourage teens and young adults across South Africa to read for pleasure, and which is currently reaching 75,000+ individuals on a monthly basis. The various panel discussions were engaging too. I specifically enjoyed the conversations on how technology can be both an enabler – encouraging the growth of literacy skills, as well as a divider – accentuating the divide between those with easy access to high-end technology and skills development and those without easy access. Interesting too were the informal chats with experts from around the globe who are working in the field of literacy. The day’s events were both energising and sobering. The talks and discussions highlighted that much more needs to be done in the field of literacy to bridge divides and build a more equal global society. At the same time, it was inspiring to hear the work of practitioners worldwide and the impacts that they are having. And, what a privilege to have had our work in South Africa recognised in this space and to be a part of the global literacy network. I was certainly in exceptionally good company, and I felt so proud of all the FunDza people – the staff, the writers, editors, contributors, beneficiary groups, grant-makers, partners, reader and writers – who have made the last six years of work possible. When we started the organisation in 2011, I had no idea how much we would and could grow in such a short space of time. Thank you to all who have made it possible. 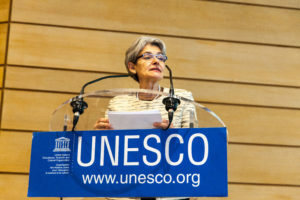 Click here to view the Live Interviews that UNESCO broadcast on Facebook with the laureates. Click here to read Mignon Hardie’s acceptance speech.